"Oh, Fair Maiden, would thou do'ith thy honor of accompanying thee to yonder tavern for a flagon of ale and a veritable bounty of nachos?" If that sounds like the perfect way for someone to ask you on a date (and if you understood what it meant), then the Renaissance Faire is definitely your kind of festival! 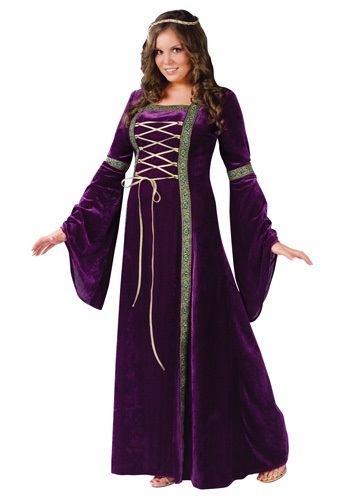 The best way to experience a Ren Faire is to show up wearing historical costumes, and when you're donning this elegant Plus Size Renaissance Lady Costume, all the knights and lords will be scrambling to take you out! There are so many classic renaissance styles to enjoy while at the fest, like a salty tavern wench, or a humble peasant, or a even an elaborate baroness outfit, if you're feeling extra luxurious. What makes this lovely gown the best look of all is that you can be whatever type of lady you'd like in it! You can be a well-to-do maiden in this royal looking dress, but if trouble arises, you can take up a sword and fight to defend your honor. You could even stop by the tavern and enjoy a couple rounds with the other festival goers, and your fancy style would fit right in! Really beautiful quality dress just the right weight . I ordered the plus size I,m about a 16 uk size and there was plenty of room even if I was another size or 2 bigger ..... but it fitted perfectly as you can pull it in at the bodice . I am 5.7 and it just skimmed the floor with flats perfect too. I had to modify the dress for me personally as I was Rapunzel or Disney princess from Tangled, so took out the gold ribbon and added white/pink/lilac cos the only dresses I could get here at short notice where flimsy and cheap looking if you are a larger size. The post was very fast ..... ordered on day 1 & received on day 3 just as promised , will most definitely be a returning customer 5* service.